On my previous trips to Bangkok, I have had the privilege of having a working parent located there and that meant free accommodation at fancy serviced apartment and for a brief time period, a driver to drive us around the city. 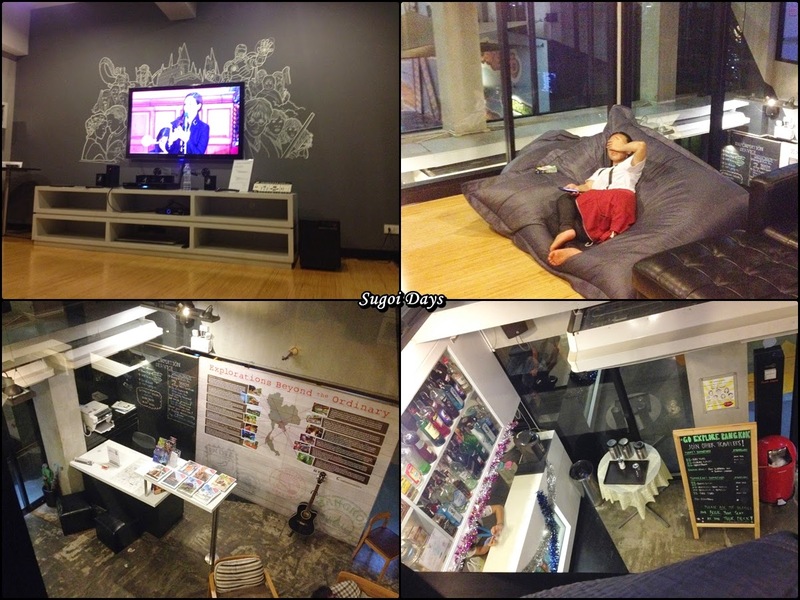 Anyway, without a luxury apartment waiting for me, it fell to me to find a place to stay in Bangkok. 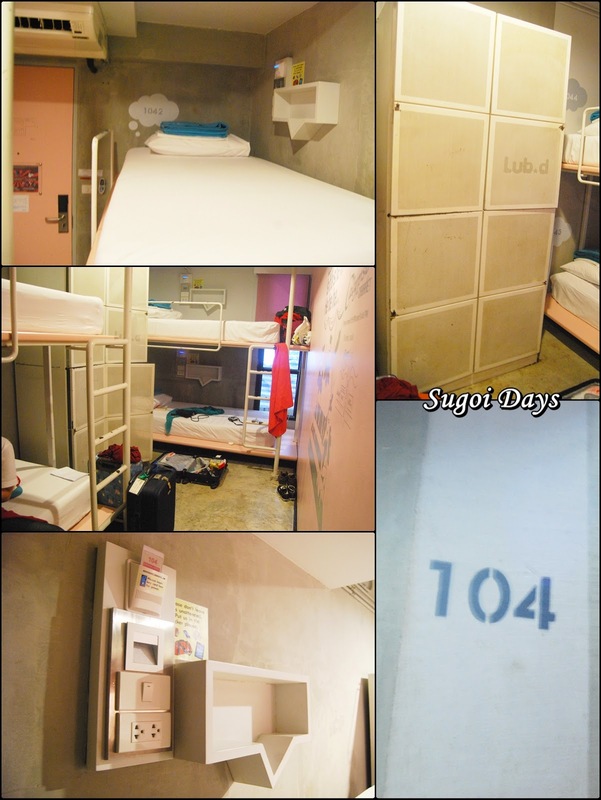 Fortunately my trip to Japan has turned my preference towards hostels as a means of a budget accommodation and after asking around amongst friends and family, I opted for Lub D, Siam Square (www.lubd.com) for my 5D4N trip to Bangkok in December 2014. Reservations were done online and when we got there, our check-in was brisk and efficient. Their staffs communicated in good English and were very helpful especially when we needed to borrow towels for our stay. We were given our key cards that tagged us in and out of the our female dormitory area, allowed us into our room and also powered up our electrical outlet by our beds. Our room was in the female dormitory area on the ground floor which meant strictly no guys and no need to carry our luggage up the flight of stairs that led to the mixed dormitories and the economic private rooms on the highest floors. I had booked three beds in the girls' dormitory and when we got there, we found that the fourth bed in our room was occupied by a French girl who has been traveling for five months. Jelly much? I was stuck with the top bunk bed and while its cozy little corner allowed me some privacy, climbing up and down to retrieve my things can be quite tiring. The bed was super comfortable with a small little shelve and power outlet at each bed for us to keep our stuffs like handphones and glasses. There were also lockers to store our luggage before going out although we needed to bring our own locks for extra security. However, I found Lub D to be so safe that we hardly locked the lockers. While it would seem that an area solely for girls would result in crowding in the shared bathroom and toilets, this was not the case with Lub D as its bathroom facilities was really spacious, well-equipped with amenities for girls and mostly importantly, clean. Amazingly not once did I have to wait my turn for the shower or toilet. The showers were amazing with hot water to ease my tired body after a long day out and about. Showers are also equipped with body wash and shampoo. Lub D has washing machines and dryers on the ground floor, ideal for those traveling light. Detergent powder is provided via a dispenser but you can also buy it from the reception for 10Baht (RM1). The washing machine is 30Baht (RM3) and the dryer 40Baht (RM4) and both takes approximately 40 minutes each to complete a cycle so planning your washing schedule is quite important. Washing after 9pm is discouraged as it could be noisy. On the first floor, Lub D offers a classy and comfortable theater room with a flat screen television and a DVD player to watch any movie from their collection free of charge. The beanbags are just wonderful to flop onto and falling a sleep in this room is a hard-to-resist temptation. The theater room overlooks their spacious, welcoming lobby area. At the lobby area, guests can check out the daily activities and tours that is organized by the hostel, use the provided computers, play games or grab a book from the shelves to read. Outside the hostel, there are lounge chairs and tables for guests to chill at and more interestingly, a blue van. Come night time, the blue van is transformed into a bar of sorts with music blasting from the audio speakers. Fortunately my room was away from the sounds and noises at night, allowing my group a good night sleep each night. Lub D Siam Square's location was the main reason I selected this branch over the Silom branch because Siam Square and the BTS lines that run through it were things I was familiar with. I knew my way around the many malls within walking distance of the hostel, thus saving my group time and money on transportation. Mahbookrong (MBK) Center was just right across the road from Lub D and accessible via the elevated walkway while Siam Paragon, Siam Discovery are just down the road. Food was plentiful in Siam Square and even right outside Lub D as there will be street food vendors outside everyday. My particular favourite was the lady selling their iconic Thai milk tea. At night, the area down the road was just bursting with life and shopping galore at the night market. A small but popular 7-11 made for a convenient place to buy drinks and snacks as well as shampoo and body wash. Instant, complete meals are also provided there and the sausages, hot off the grill, are seriously delicious. 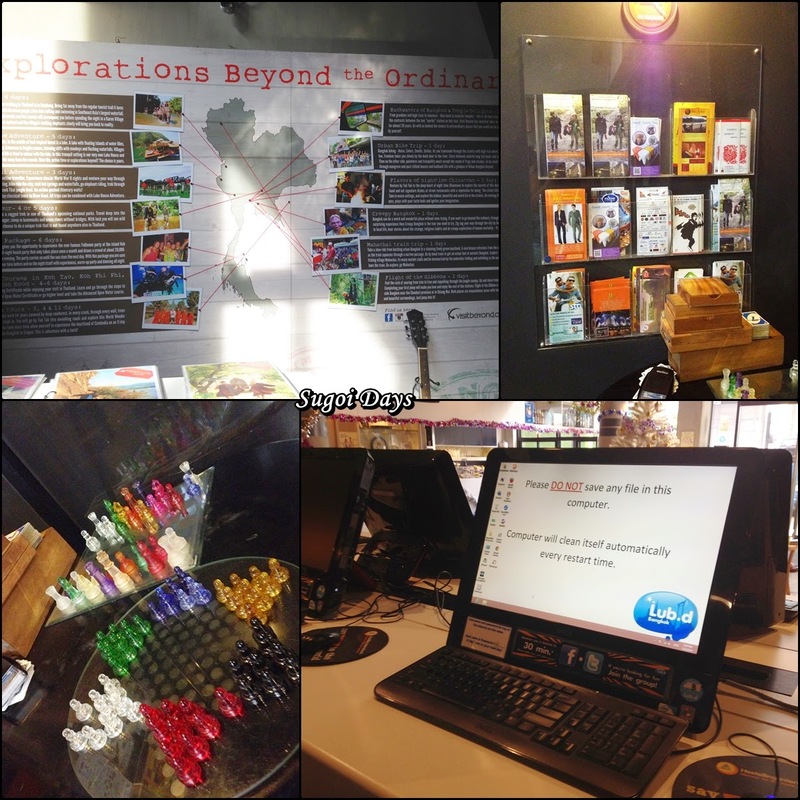 Getting to Lub D Siam Square was easy due to its location in the middle or close by all the popular malls in Bangkok. For those coming from Don Mueng Airport, I would recommend grabbing a cab to the hostel. We used a metered cab and our fees came up to about 400Baht (RM40) due to traffic. I have been advised the prices from the airport to Lub D is between 300 - 500Baht (RM30 - 50). To indicate the hostel, we told the cab driver, it was opposite MBK and showed him the map provided by the hostel via email upon booking. For those coming from the Suvarnabhumi International Aiport, you have the option of taking the train to Lub D which will require you to get off at Phaya Thai station, transit over to the BTS and from there, take the BTS to Siam Square and transit over to get to National Stadium stop. Upon disembarking, follow the signs to Exit 1. Lub D should be visible from the exit and all you need to do is take the stairs down to the street level to get to it. Rates for a bed in the dormitory of Lub D ranges between 500 - 600Baht (RM50-60) per night. My four nights stay came up to 2380Baht (RM238) per person. It was a little more expensive than the average hostel but still a lot of cheaper than a hotel given its strategic location with easy access to malls, food and public transportation. For the budget-conscious traveler, Lub D Siam Square offers the customer service and cleanliness of a 5 star hotel with the warmth and hominess of a home stay on a hostel budget. Its other branch is located just off Silom road and within walking distance of Patong. Both outlets offer free wifi to its guests, a rare commodity for hostels to offer without charge. For more information on Lub D, click here to go to their website. Happy travels!